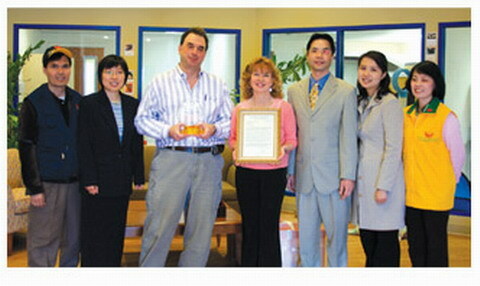 On March 28, Golden Year 6 (2009), Mr. and Mrs. Jonathan Rosenberg, the founders and executive directors of Tabby’s Place, a cage-free sanctuary in Ringoes, New Jersey, received the Shining World Hero Award from Supreme Master Ching Hai. This Award was presented in recognition of their outstanding noble and compassionate efforts towards providing a safe and loving sanctuary for cats in hopeless situations. 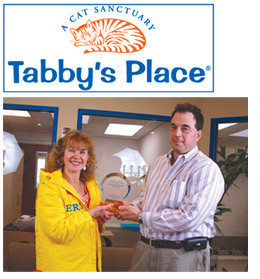 Mr. and Mrs. Rosenberg created Tabby’s Place in 2003 in memory of their beloved cat named “Tabby,” a stray that was adopted by the couple but later died because of untreatable cancer. To commit themselves to creating Tabby’s Place, Mr. Rosenberg resigned from his job and the couple put in more than US$2 million out of their own pocket. The cat residents in the sanctuary come primarily from public shelters where they had been scheduled to be euthanized. At Tabby’s Place, they are provided not only a loving home, but also medical and surgical treatment, thus allowing old, chronically ill or handicapped cats to live full and happy lives. According to Mr. Rosenberg, some cats that were assessed by professional vets to have only a couple of months to live have lived much longer in the sanctuary. These are the treasured miracles made with love at Tabby’s Place! With the help of donations and volunteer workers from all over the world, the sanctuary has rescued almost 700 cats, with approximately 550 being successfully re-homed. The Award ceremony was held at Tabby’s Place by our Association members from the New Jersey and Pennsylvania Centers. In addition to Master’s Award Letter and the beautiful crystal Award plaque, Mr. and Mrs. Rosenberg were also presented with a monetary contribution of US$5,000 for Tabby’s Place as well as many other gifts from Master, including Her books, DVDs, CDs, vegan chocolates, a Hero T-shirt and a custom-made Heroine jacket. Our members also shared homemade vegan cookies with the couple, the other staff members and volunteers at Tabby’s Place. During the Award ceremony and in a follow-up letter, the couple expressed their heartfelt appreciation to Master for Her support, saying, “It takes someone special to care for the most vulnerable cats, and we are all grateful that our kitties have you as a friend. From darling diabetic Ringo, to paraplegic Tashi, to Donny the kitten, we thank you for every cat you’ve helped us to rescue and place in a loving forever home.” They also offered an open invitation to Master to come and visit Tabby’s Place. Thank you, Mr. and Mrs. Rosenberg, for creating such a heavenly place for our feline friends. May your gracious example of love in action be an inspiration to more people in the world to treat our all co-inhabitants with such kindness and consideration.